George W Bush is back in the political limelight after a long hiatus to support brother Jeb’s campaign to become president number 45. Number 43 made an appearance Monday at a South Carolina rally, the state he won in 2000 after beating Senator John McCain. South Carolina, the next state for Republicans, is seen as crucial for Bush’s chances following a disappointing fourth-place finish in New Hampshire. 43 brought up “name-calling” in the election, before quoting their father, number 41. “Labels are for soup cans,” said W.
He added the US did not need a president “who mirrors and inflames our frustration”. “If being president of the United States makes me part of the establishment, well I proudly carry that label,” he said, before praising his brother’s experience and demeanor. "In my experience, the strongest person usually isn't the loudest in the room." W also brought up 9/11 to remind the crowd that a president may face unexpected crises and mentioned Jeb’s “calm resolve”, which presumably is kind of like 43’s “seven minutes of silence” after he was told about the second attack. George W. Bush Reads 'My Pet Goat' in 'Fahrenheit 9/11' from MMFlint on Vimeo. W’s wife Laura Bush and South Carolina Senator Lindsey Graham joined the brothers onstage. 43 appeared happy to be back on the campaign trail - and joked about his new hobby of oil painting. It’s not clear if the former president will help or hurt his brother’s success on Saturday. Donald Trump has been criticizing 43’s handling of Iraq and blamed him for 9/11. 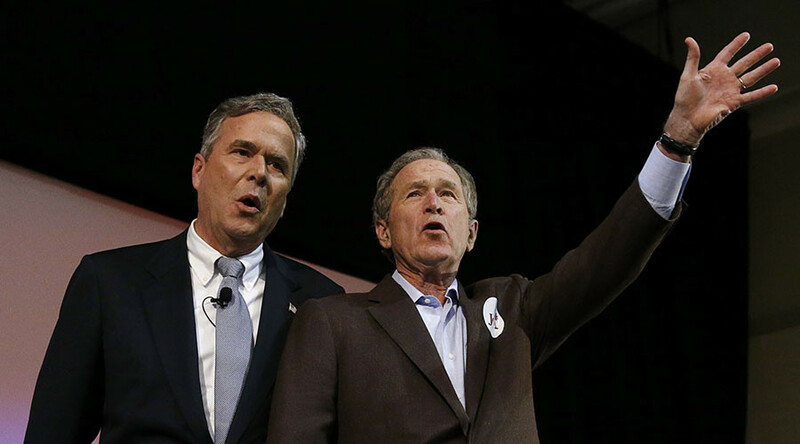 Now that George Bush is campaigning for Jeb(! ), is he fair game for questions about World Trade Center, Iraq War and eco collapse? Careful! "Excuse me, the World Trade Center came down during the reign of George Bush, right? I mean, it came down," Trump told reporters during a press conference in South Carolina. "We weren't safe. That was the greatest attack in the history of the United States," he said.